The digital media arts center Harvestworks just announced that one of their 2008 Artists-In-Residence is developing a "knitting needle working symphony." A knitting needle working symphony. 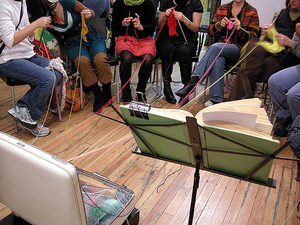 Approx 40 knitter-performers knit in unison creating a singular knit object-environment. The knitters needles will be equipped with mini pick-up microphones, and the knitters will be networked to send in these sounds via internet. The sound is then recorded, played and mixed in a live installation: a virtual knitting circle-score as immersive audio-video environment. Laure recently received the Janet and Walter Sondheim Prize." More info on her work at Craftzine, the source of the above image.